The Maiden, an older Scottish design of the Guillotine. This example is an exhibit at the Museum of Scotland, Edinburgh. The guillotine, a device for performing executions by decapitation, comprises a tall upright frame from which is suspended a heavy blade that is raised with a rope and then allowed to drop, severing the victim's head. The device is noted for long being the main method of execution in France and, more particularly, for its use during the Reign of Terror following the French Revolution. It was introduced in France on the suggestion of Joseph-Ignace Guillotin in an effort to provide a more humane method of execution. It was also seen as egalitarian, unlike previous punishments, as it became the method of execution for nobility and commoners alike. Used in other countries, notably Nazi Germany, the guillotine was implemented in tens of thousands of executions, many of them in public. Concern was raised that death by guillotine was not as humane as claimed. Finally, however, in 1981 the guillotine was retired, accomplishing Dr. Guillotin's ultimate goal after almost two centuries with the abolition of the death penalty. The guillotine became infamous (and acquired its name) in France at the time of the French Revolution. However, guillotine-like devices, such as the "Halifax Gibbet" and Scottish "Maiden," existed and were used for executions in several European countries long before the French Revolution. The first documented use of the Maiden was in 1307 in Ireland, and there are also accounts of similar devices in Italy and Switzerland dating back to the fifteenth century. However, the French developed the machine further and became the first nation to use it as a standard execution method. 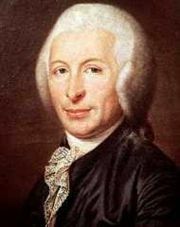 The device derives its name from Joseph-Ignace Guillotin, a French doctor and member of the Revolutionary National Assembly, on whose suggestion it was introduced. Dr. Guillotin, who was actually opposed to the death penalty, proposed the use of a mechanical device to carry out the punishment. The basis for his recommendation is believed to have been his perception that it was a humane and less painful form of execution, contrasting with the methods used in pre-revolutionary, ancien régime (old regime) France, would be one step towards the total elimination of capital punishment. In France, before the guillotine, members of the nobility were beheaded with a sword or axe, while commoners were usually hanged, or more gruesome methods of executions were used (the wheel, burning at the stake, and so forth). In the case of decapitation, it sometimes took repeated blows to sever the head completely. The condemned or the family of the condemned would sometimes pay the executioner to ensure that the blade was sharp in order to provide for a quick and relatively painless death. The guillotine was thus perceived to deliver an immediate death without risk of misses. Furthermore, having only one method of execution was seen as an expression of equality among citizens. The guillotine was adopted as the official means of execution on March 20, 1792. From that time the guillotine was the legal execution method in France until the abolition of the death penalty in 1981. The only exceptions were execution by firing squad, which was used for certain crimes against the security of the state. 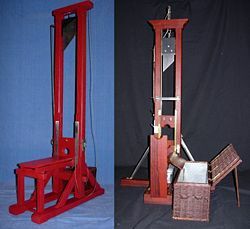 Historic replicas (1:6 scale) of the two main types of French guillotines: Model 1792, left, and Model 1872 (state as of 1907), right. Antoine Louis (1723 — 1792), member of the Académie Chirurgicale, developed the concept put forward by Guillotin, and it was from his design that the first guillotine was built. The guillotine was first called louison or louisette, but the press preferred guillotine. Antoine Louis (and perhaps others) introduced several improvements over the guillotine's ancestors, notably the characteristic angled blade and the lunette—the two-part circular collar that held the victim's head in place. On April 25, 1792, highwayman Nicolas J. Pelletier became the first person executed by guillotine. When Guillotin himself died, it wasn't on his invention as legend would have it, but instead of natural causes on May 26, 1814. The period from June 1793 to July 1794 in France is known as the Reign of Terror or simply "the Terror." The upheaval following the overthrow of the monarchy, fear of invasion by foreign monarchist powers, and fear of counterrevolution from pro-monarchy parties within France all combined to throw the nation into chaos and the government into a frenzied paranoia. Most of the democratic reforms of the revolution were suspended and wholesale executions by guillotine began. Former King Louis XVI and Queen Marie Antoinette were executed in 1793. Maximilien Robespierre became one of the most powerful men in the government, and the figure most associated with the Terror. The Revolutionary Tribunal sentenced thousands to the guillotine. Nobility and commoners, intellectuals, politicians and prostitutes were all liable to be executed on little or no grounds—suspicion of "crimes against liberty" was enough to earn one an appointment with "Madame Guillotine" (also referred to as "The National Razor"). Estimates of the death toll range between 15,000 and 40,000. In July 1794, Robespierre himself was guillotined. At this time, Parisian executions were carried out in the Place de la Revolution (former Place Louis XV and current Place de la Concorde, near the Louvre). The guillotine stood in the corner near the Hôtel Crillon where the statue of Brest can be found today. 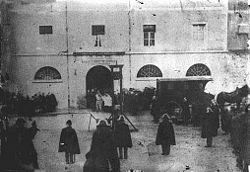 Public guillotining in Lons-le-Saunier, 1897. For a time, executions by guillotine were a popular entertainment that attracted great crowds of spectators. Vendors would sell programs listing the names of those scheduled to die. Regulars would come day after day and vie for the best seats. Parents would bring their children. By the end of the Terror the crowds had thinned drastically. Excessive repetition had staled even this most grisly of entertainments, and audiences grew bored. The last public guillotining was of Eugene Weidmann, who was convicted of six murders. He was beheaded on June 17, 1939, outside the prison Saint-Pierre rue Georges Clemenceau five at Versailles, which is now the Palais de Justice. The allegedly scandalous behavior of some of the onlookers on this occasion, and an incorrect assembly of the apparatus, as well as the fact it was secretly filmed, caused the authorities to decide that executions in the future were to take place in the prison courtyard. The last execution in France was of Hamida Djandoubi and took place on September 10, 1977. The death penalty in France was abolished in 1981. 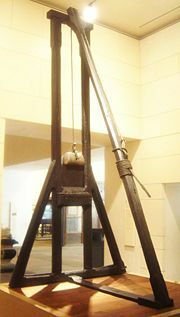 Guillotine as used in Baden, Germany (reconstruction, museum at Bruchsal). Just as there were guillotine-like devices in countries other than France before 1792, other countries, especially in Europe, similarly employed this method of execution. A notable example is Germany, where the guillotine is known in German as Fallbeil ("falling axe"). It has been used in various German states since the seventeenth century, becoming the usual method of execution in Napoleonic times in many parts of Germany. Guillotine and firing squad were the legal methods of execution in the German Empire (1871-1918) and Weimar Republic (1919-1933). The original German guillotines resembled the French Berger 1872 model but eventually evolved into more specialized machines. They were largely built of metal, with a much heavier blade enabling shorter uprights to be utilized. Accompanied by a more efficient blade recovery system and the eventual removal of the tilting board (or bascule) this allowed a quicker turn-around time between executions, the victim being decapitated either face up or down depending on how the executioner predicted they would react to the sight of the machine. Those deemed likely to struggle were backed up from behind a curtain to shield their view of the device. 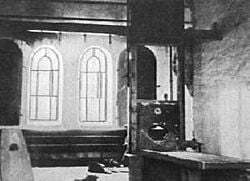 The death room at Plötzensee - The guillotine can be seen in the foreground, and the gallows in the background. The Nazi Party employed it extensively—twenty guillotines were in use in Germany which, from 1938, included Austria. In Nazi Germany, beheading by guillotine was the usual method of executing convicted criminals as opposed to political enemies, who were usually either hanged or shot. An exception was made for the six members of the White Rose anti-Nazi resistance organization, who were beheaded in 1943. The Nazis have been estimated to have guillotined some 40,000 people in Germany and Austria—possibly more than were beheaded during the French Revolution. The last execution in the German Federal Republic occurred on May 11, 1949, when 24 year old Berthold Wehmeyer was beheaded for murder and robbery in Moabit prison in West Berlin. West Germany abolished the death penalty in 1949, East Germany in 1987, and Austria in 1968. In Sweden, where beheading was the mandatory method of execution, the guillotine was used for its last execution in 1910 in Långholmen prison, Stockholm. The guillotine has never been used in the United States as a legal method of execution, although it was considered in the nineteenth century before introduction of the electric chair. In 1996, however, Georgia state legislator Doug Teper proposed the guillotine as a replacement for the electric chair as the state's method of execution, to enable the convicts to act as organ donors. The proposal was not adopted. From its first use, there has been debate as to whether or not the guillotine always provided as swift a death as Dr. Guillotin had hoped. With previous methods of execution, there was little concern about the suffering inflicted. However, since the guillotine was invented specifically to be "humane," the issue was seriously considered. Furthermore, there was the possibility that the very swiftness of the guillotine only prolonged the victim's suffering. The blade cut quickly enough so that there was relatively little impact on the brain case, and perhaps less likelihood of immediate unconsciousness than with a more violent decapitation, or long-drop hanging. 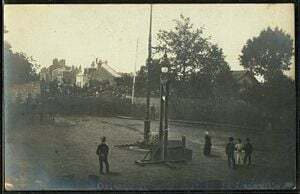 Execution of Languille, in 1905. Here, then, is what I was able to note immediately after the decapitation: the eyelids and lips of the guillotined man worked in irregularly rhythmic contractions for about five or six seconds. ... I waited for several seconds. The spasmodic movements ceased. ... It was then that I called in a strong, sharp voice: 'Languille!' I saw the eyelids slowly lift up, without any spasmodic contractions – I insist advisedly on this peculiarity – but with an even movement, quite distinct and normal, such as happens in everyday life, with people awakened or torn from their thoughts. Next Languille's eyes very definitely fixed themselves on mine and the pupils focused themselves. I was not, then, dealing with the sort of vague dull look without any expression, that can be observed any day in dying people to whom one speaks: I was dealing with undeniably living eyes which were looking at me. After several seconds, the eyelids closed again, slowly and evenly, and the head took on the same appearance as it had had before I called out. It was at that point that I called out again and, once more, without any spasm, slowly, the eyelids lifted and undeniably living eyes fixed themselves on mine with perhaps even more penetration than the first time. Then there was a further closing of the eyelids, but now less complete. I attempted the effect of a third call; there was no further movement – and the eyes took on the glazed look which they have in the dead. Anatomists and other scientists in several countries as recently as 1956 tried to perform more definitive experiments on severed human heads, however the evidence is only anecdotal. What appears to be a head responding to the sound of its name, or to the pain of a pinprick, may be only random muscle twitching or automatic reflex action, with no awareness involved. At worst, it seems that the massive drop in cerebral blood pressure would cause a victim to lose consciousness within several seconds. ↑ Patrick Robertson. The Book of Firsts (Clarkson Potter, 1974). ↑ Joseph Ignace Guillotin WhoNamedIt. Retrieved August 8, 2007. ↑ Dr. Beaurieux's Report. The History of the Guillotine. Retrieved August 8, 2007. ↑ Excerpt from British Medical Journal, Vol 294: February, 1987 Retrieved August 8, 2007. This page was last modified on 18 July 2017, at 19:05.